It's nerd out day. The heck with Easter, Christmas, Labor Day, Mother's Day or the rest of those days. Today, for we nerds, is the day: Star Wars Day. I am sure I have mentioned it here enough, but I am a huge Star Wars fan. Read most of the EU, own the movies on multiple formats, soundtracks, toys, action figures, cereal boxes, display units....you name it. If you need it, I probably have it. But you ain't getting it. 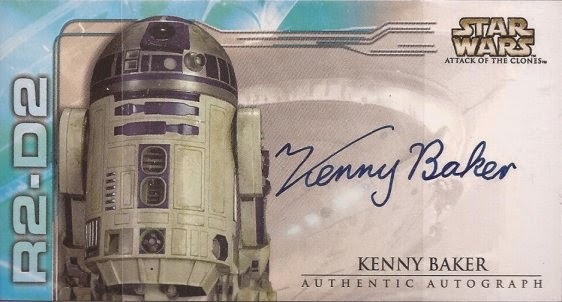 This is the only autograph card I have in my collection. And that line you see was me being too lazy to pull the two penny sleeves off before I scanned it. I remember buying a lot of these AOTC widescreen cards hoping to pull an auto, and this is the one I finally yanked. Nice on card. 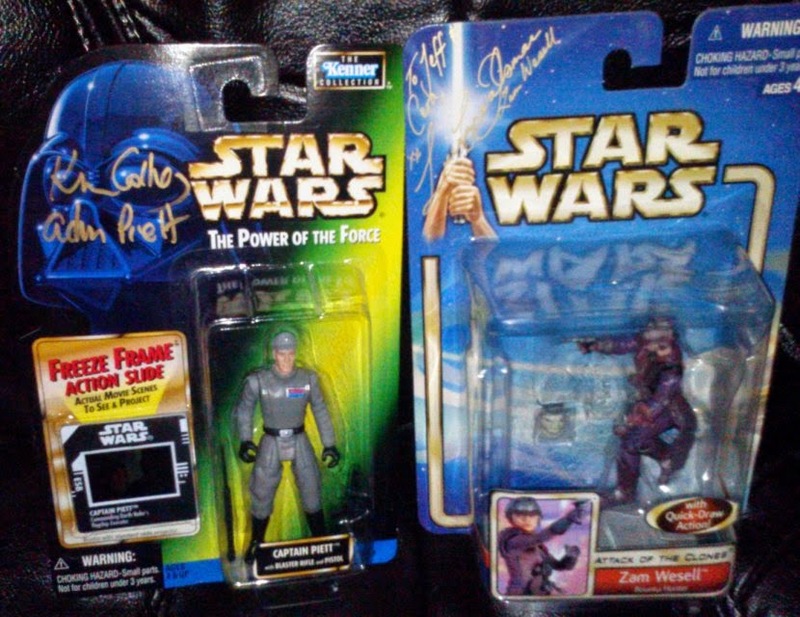 It's pretty much a given that every SW fan who has at least one autograph in their collection probably has Jeremy Bullock. He appears everywhere he can, and is a really nice guy. My son got this at C2 in Indianapolis 2002. A friend of mine in the 501st was heading to an event out of town about 10 years ago. He made mention that Dermot Crowley was in attendance and I asked him to grab me an auto. Nice 11x17 picture that I really need to get framed. I like the personalization from Dermot - "We have stolen a small Imperial shuttle." 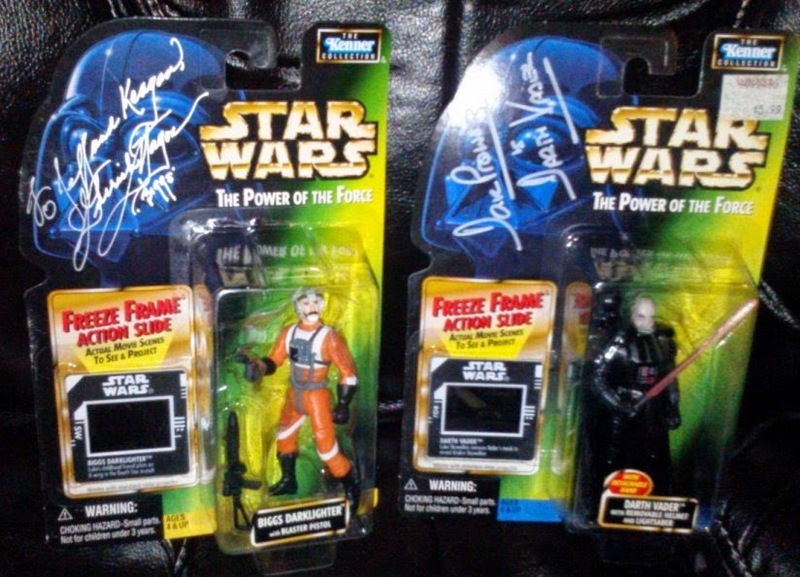 These are the very first autographs I ever got of any Star Wars actors. My son and I went to Wizard World Chicago in 1998, I think. Looking back, I should have paid much more attention on the figure I picked for Mr. Prowse. Garrick Hagon was another very nice guy and spent a minute or so chatting with my son and I. With the rise of Mara Jade in the canon of Star Wars (though, I believe she is now wiped from the timeline), Decipher Inc (with approval from LucasFilm) picked Shannon Baksa as the original image of Mara Jade. 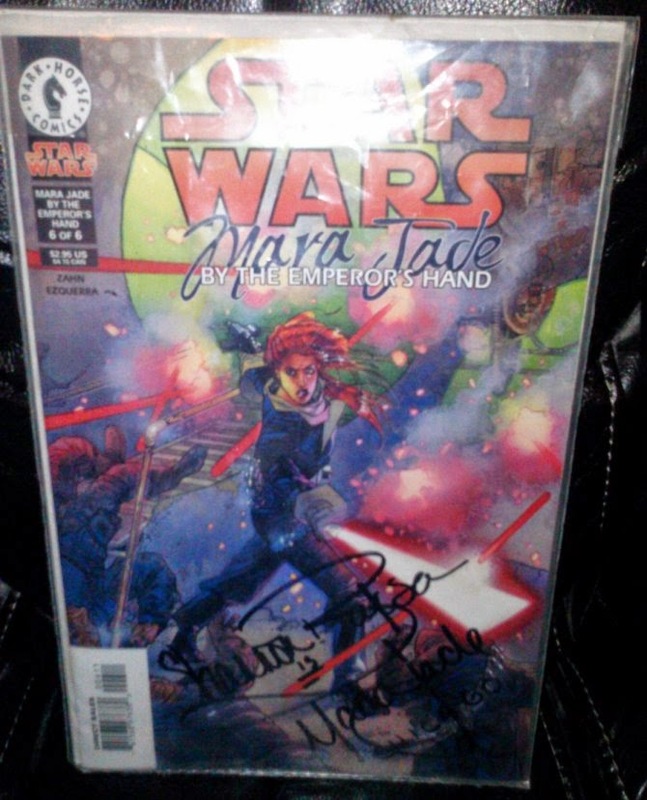 Shannon was at the same Wizard World as Mr. Prowse and Garrick, so I picked up a comic book and snagged her autograph. At another Wizard World, or this may have been at a different con, I picked up these two. 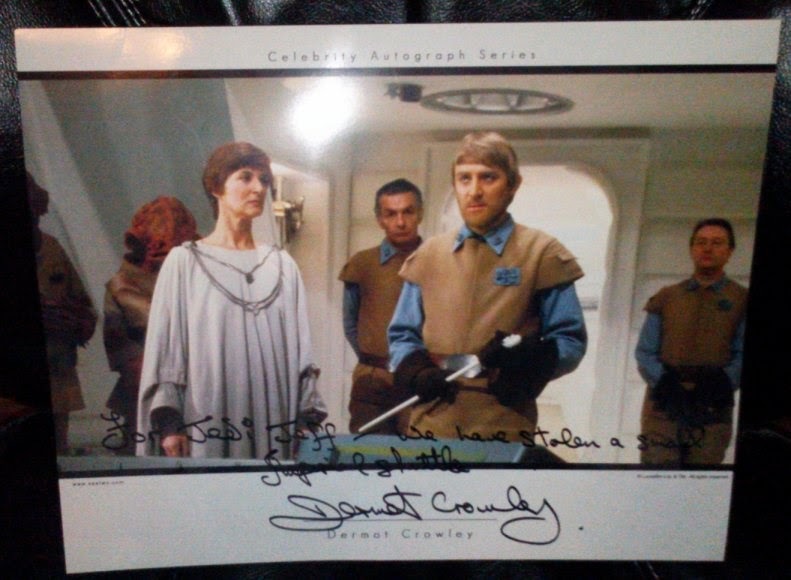 Ken Colley portrayed Capt Piett in ESB, quickly gaining an in field promotion to Admiral. 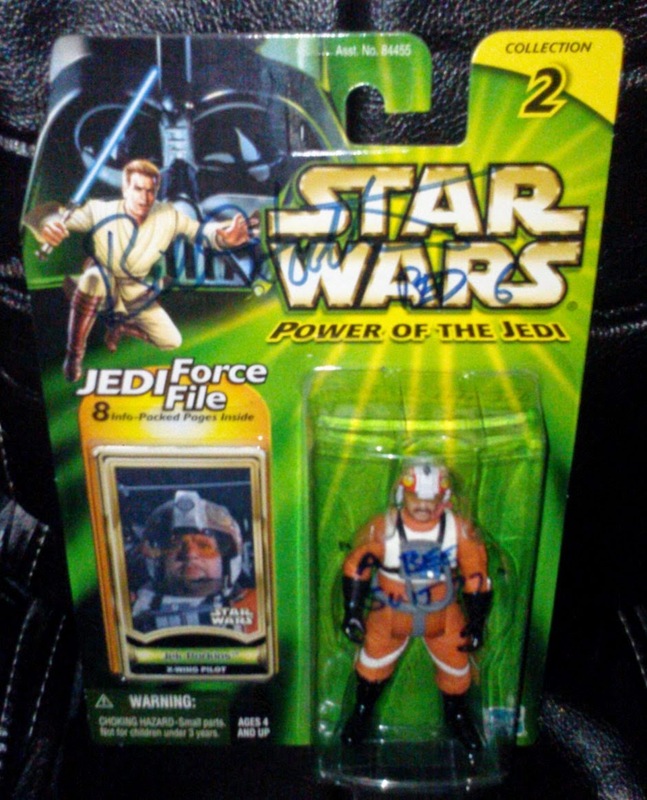 I love how the figure is labeled "captain" and Ken signed in "Adm" for admiral. 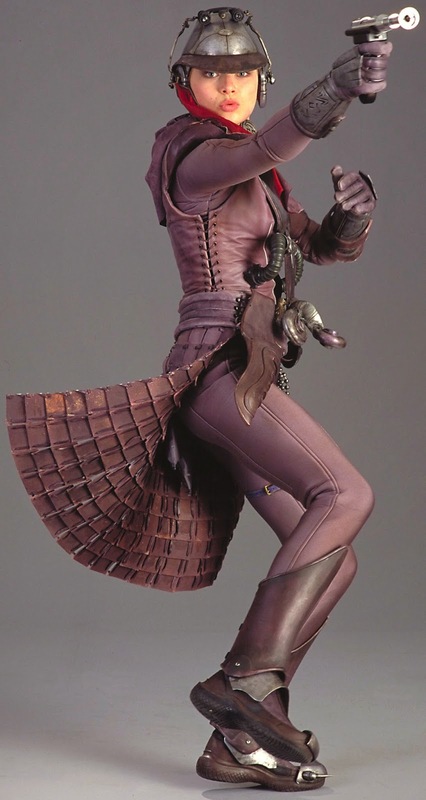 Zam Wesell was the changling bounty hunter in AOTC. The main reason I wanted Leeanna Walsman's auto? I LOVE this picture. I think it's the kissy face Leeanna is making. But Zam is also one of those unique characters that are a little off the track for the normal fan, so an add for my collection. I think the pilots in the films are my favorite characters. Don't ask me why a dress up as a Jedi - I need to get an X-Wing pilot suit built. However, at C2, I picked up two other autographs as photos, since figures for the two don't exist. 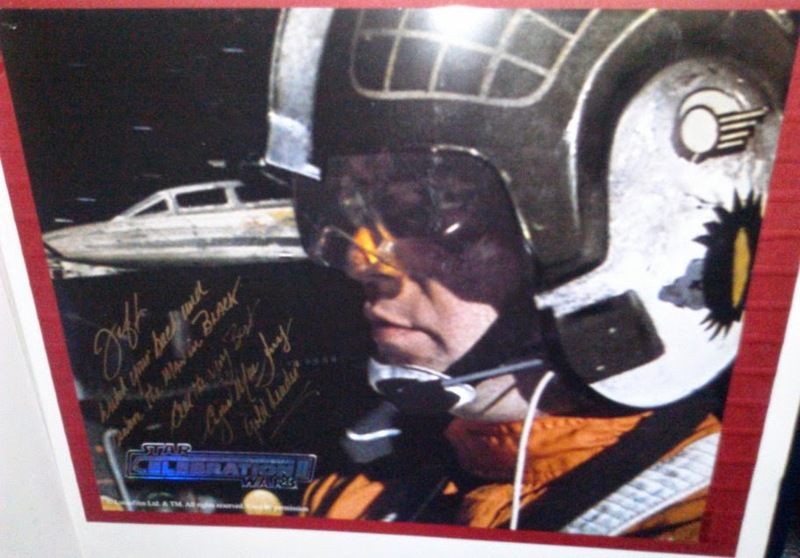 Angus MacInnes was Dutch Vander, Gold leader on the attack on the Death Star in ANH. I think the EU does a great job of giving more life to characters that don't appear that much in the movies. And through that expansion, Wes Janson is my favorite SW character. 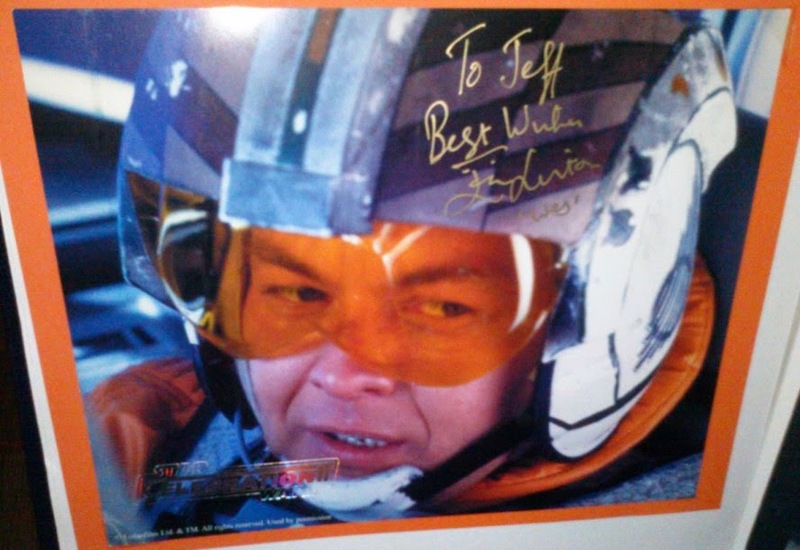 Go and read Rogue Squadron, Wraith Squadron, and my all time favorite EU book, Starfighters or Adumar, a book that when I handed it to the author, the late Aaron Allston, to autograph, he commented "wow, this is pretty beat up" to which I replied "I think I have read it six times already." Wes is fleshed out to be a sarcastic ladies man, extremely humorous and a talented fighter. I just had to get Ian Liston's signature. Of all my autographs, however, this last is my favorite. But a quick side story first. When Celebration 2 was held in Indianapolis, a lot of SW friends I meet through messages boards took part in helping set it up as well as volunteer time. Many of them took the really tough role of being chaperones for the autograph guests. I knew I would be getting the autograph of William Hootkins. My friend Erica was his chaperone, and she told him a story (well known in my circle of friends) of my previous career as a mascot for a profession soccer team. William, a really great and funny guy, gave me a special, personalized autograph. If you look close, on the bubble, he wrote "a bee suit?" Best auto ever. Very cool collection. I've been a fan since I was a kid. 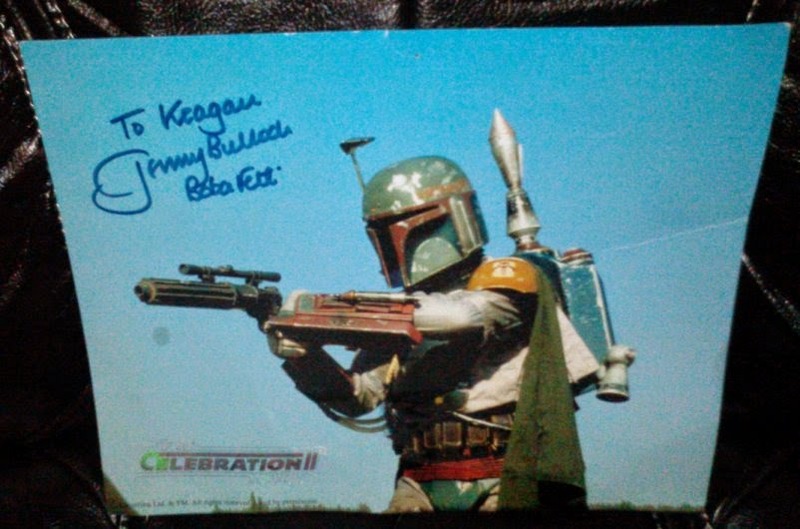 The only autograph I own is of Daniel Logan... Baby Fett. But my dream is definitely to add a Jeremy Bullock to the PC.